Looking for the Next Tonya to Generate Olympic Buzz? 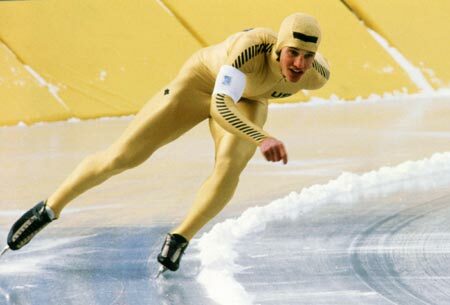 Eric Heiden powers his way to a gold medal in the men's 1000 meters, at the Lake Placid Olympics in 1980. It was one of five golds for the American speed skater. Here's the thing about the Winter Olympics. Forget how obscure the sports are. The Winter Games have a way of generating their own buzz. Just wait until the Olympic cauldron is lit, something will happen to make the games catch fire. Pick just about any Winter Olympics from years past and there was something that kept people riveted. The term "French skating judge" hardly needs an explanation. Marie Reine Le Gougne set off the pairs skating scandal and made the 2002 Games in Salt Lake City must-see TV. You might not remember that the 1994 games were held in Lillehammer, Norway. But you do remember Nancy Kerrigan and Tonya Harding. After the famous "kneecapping" attack on Kerrigan at the U.S. nationals, no one was going to miss those two at the Olympics. Speed skating isn't exactly a national pastime. But it became one for several days in 1980 as Eric Heiden was sweeping five gold medals. The speed skaters Bonnie Blair and Dan Jansen created a fair amount of buzz during their Olympic careers. Watch for the sport to make a big splash again in Turin. A brash Texan named Chad Hedrick could win a bunch of gold medals. That is, unless, Shani Davis, the first African-American Olympic speed skater, does instead. A number of top American speed skaters, including Hedrick, made the switch from competitive inline skating to the ice. Look for the rivalry between the former inline skaters and traditionalist speed skaters from the Netherlands and Norway to become an interesting wrinkle in Turin. One more thing about Eric Heiden and 1980: he wasn't even the biggest story at Lake Placid. That, of course, was the "Miracle on Ice" U.S. men's hockey team. The U.S. upset of the Soviets in the semifinals is widely considered one of the top moments in American sports history. The team and their coach were the inspiration for the 2004 Disney movie Miracle. It's a Winter Olympics story that's still generating buzz today.